Documents and whistleblowers suggest that officials bent rules and provided special advice to Abe's friend, Kotaro Kake, to help him open a new veterinary school in western Japan. Japanese Prime Minister Shinzo Abe answers a question during a session of the Upper House Budget Committee in Tokyo Tuesday, July 25, 2017. Japanese lawmakers questioned Prime Minister Shinzo Abe in parliament for a second day Tuesday about a cronyism scandal, with some opposition members accusing him of testifying falsely a day earlier when he denied using his influence to help a friend. 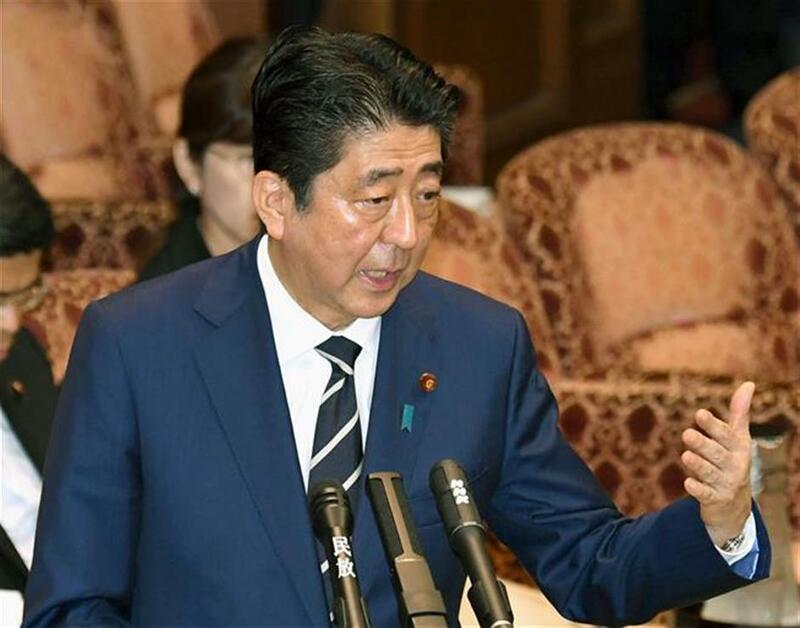 The two-day hearing in parliament focused on whether Abe was personally involved. Abe repeatedly denied using his influence to help Kate, and said he learned of the plan for the school only after Kake submitted a formal application in January. "We meet as friends, but we never seek or give favors," Abe said. "I have never advised him to visit the ministers in charge." Opposition lawmakers slammed Abe for giving several different dates for when he first learned of his friend's plan for a new veterinary school, with some accusing him of perjury. They said it was impossible for Abe to be unaware of his friend's years-long plan until January if other officials already knew. Since the late 2000s, Kake and the city of Imabari worked together to open a veterinary school in the region, but were unsuccessful until the creation of a special economic zone directly headed by Abe. Abe is expected to reshuffle his Cabinet after scandals and the railroading of unpopular legislation pushed his approval ratings as low as 26 percent. Given the lack of significant center-left alternatives or strong rivals within his party, Abe's tenure as prime minister is not under immediate threat. Still, Abe is getting the message that he will need to work harder on accountability and may have to tread more softly in pushing some of his political priorities, such as a revision of Japan's war-renouncing constitution. The school scandal erupted after a former top education ministry official, Kihei Maekawa, said Abe's office had exerted significant influence over the school's approval. He said one of Abe's top aides at the Cabinet Office told him to step up the effort and that he was delivering the message on behalf of Abe because "the prime minister cannot say so himself." Scores of documents released by other whistleblowers and a subsequent internal probe by the Education Ministry showed pressure for the approval of Kake's application came from "top levels" of the Prime Minister's Office. During the parliamentary hearings, several witnesses, including ministry officials and former members of an Abe-commissioned panel promoting deregulation, said they were not directly instructed by Abe to approve the school.